Our guests will be picked up in the morning from the hotels for the full day Bosphorus Cruise and Dolmabahce Palace Tour. Firstly, we will visit Spice Market; this covered market is a building located to the southwest of the Yeni Cami. The market is specialized in sale of spices and herbs, as well as medicinal plants and drugs. Afterwards we will start unique Bosphorus Cruise through the waterway separating the two continents, Europe and Asia, with a possibility to take photographs of marble palaces, ancient wooden villas of Ottoman architecture besides modern residential and luxurious apartments. On the way back we will see Dolmabahce Palace; the last residence of Ottoman Sultans with 365 rooms and 22 saloons. It is famous with the great collection of European antiquity, furniture and 4.5 tons chandelier. Guests will be dropped to hotels after the tour. Tours are led by a licensed professional tour guide. The guests will be picked up from hotels and go to the port with guide to board boat to the Princess Islands. 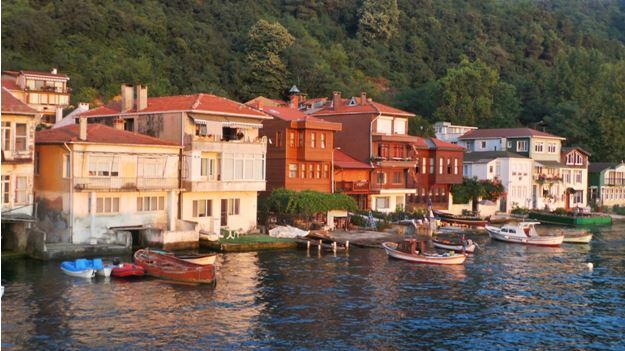 The biggest and most interesting one – Büyükada – will be our destination of the day. Büyükada is the largest of the nine so-called Princess Islands in the Sea of Marmara, near Istanbul, with an area of about two square miles. While cruising, it is possible to see landmarks like Topkapi Palace and Maiden’s Tower, which was featured in the James Bond film – The World is Not Enough -. The guests will walk through the streets with the guide for feeling the atmosphere of island life. Vehicles are notably non-existent here visitors can take the tour of the island by a phaeton to see magnificent panoramic view of Buyukada. The guests will have lunch at a seafood restaurant and then spend the rest of the day at leisure on the island. They should bring bathing suits if they want to swim. They may also enjoy the island’s souvenier shops and waterfront cafes. They will meet the guide at a arranged time for the boat and be dropped to hotels by the guide. Our tours are led by licensed professional tour guides. The guests will see Istanbul’s beautiful water side mansions and palaces together with beautiful architecture during this full-day tour from the boat. They will explore whole Bosphorus with its beauty by getting info from the tour guide on the boat. We will see top Istanbul attractions like the Dolmabahce Palace and Beylerbeyi Palace from the boat. Also guests will see Rumeli Fortress and Bosphorus Bridge. Yoros Castle and the village of Anadolu Kavagi are a popular day trip from Istanbul. Visitors are free to climb all over the ancient walls. They will take a breath over lunch at a seafood restaurant, and then they will head to Yoros castle to see one of the most beautiful Byzantine castle of Istanbul and Black See shores. On the way back the guests can enjoy the view of Bosphorus strait. The guide will drop them back to the hotels at 18:00. Tours are led by licensed professional tour guide.